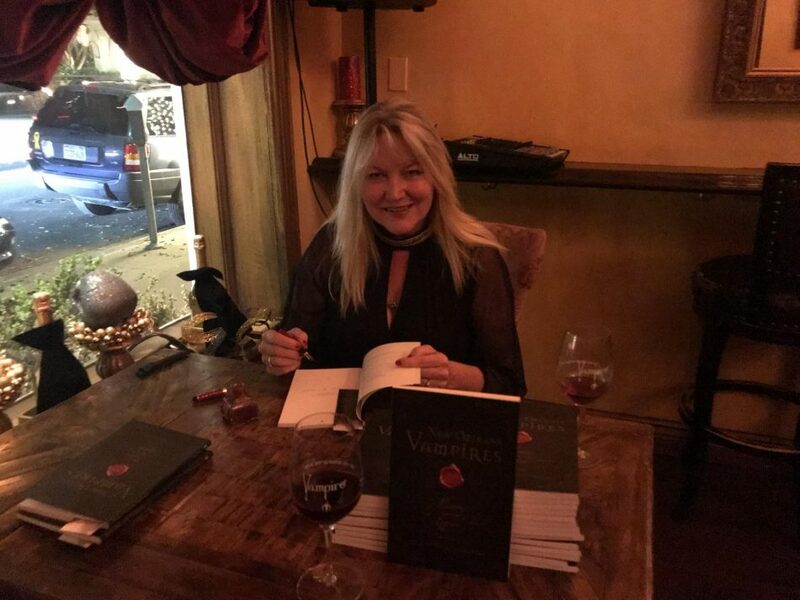 Marita Woywod Crandle, proprietor of Boutique du Vampyre, New Orleans, and author of New Orleans Vampires: History and Legend (2017), seen here during a book signing at the Vampire Lounge & Tasting Room, Beverly Hills, December 11, 2017. Picture: Brian Cohen. Sometimes history becomes lost within overlays of contemporary thought. This book came with an accompanying letter, wax sealed, from the author to the reader about the time she was able to inspect the attic of the Ursuline Convent in the French Quarter of New Orleans (focal point for one of the vampire stories she looks at in her book). Within it she mentions “surely [the vampires] would have been tortured by the thousands of peering lights that shone their beams through the slats of wood.” This ignores the fact that the real connection between vampires and sunlight was established through the film Nosferatu, eine Symphonie des Grauens (1922)—in other words it was an invention of the cinematic vampire. 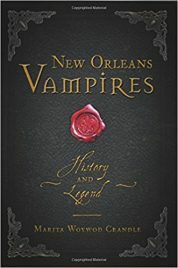 There was unlikely a connection between New Orleans and vampires prior to Anne Rice established the connection, as the author says “Anne Rice brought such wonderful attention to New Orleans with the Vampire Chronicles series” (19). That’s not to say vampirism wouldn’t have been part of the original folklore of the city. 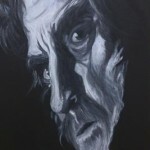 There may well have been a long-standing belief in vampire similar to those beliefs in New England—supernatural scapegoats for the victims of consumption, used to explain a terrible disease, and who were far from the romantic vampire born from ink and film. There likely also will have been mythology based around such vampiric forms as Old Hag, as part of the traditions brought by enslaved Africans. These are not the concerns of this volume but that does not mean to say that this book has no value. Indeed, it has plenty of value in tracking modern built myths and folklore that reaches to the past with the hand of modernity. From a folklorist point of view, it is a fascinating look into the birth of mythology and—it has to be said—it is well written. The author, I am fairly sure, knows that the stories included are likely nothing to do with vampires and actually puts some tells in the text. Talking of vampiric serial killers, the Carter Brothers (whose factual existence a quick google failed to establish) she says “If the Carter Brothers and vampires existed in 1930s New Orleans” (84, my emphasis). There is an understanding that the Casket Girls, the primary subject of the book, actually will never have historically crossed paths with the Ursuline Sisters. Whilst I would have liked to have seen more concentration of the fanciful nature of these legends that was really not the point of the book. The book itself is, as I have mentioned, well written. It is short but boasts some lovely illustrations and is indexed. There is a limited bibliography though there is a lack of referencing, probably due to the “urban legend”/modern mythological nature of the stories. The preface over-conflates the connection between Vlad Ţepeş and vampires (there is only the borrowing of the name Dracula by Stoker) and I have to say that whilst the author’s familial name of Woywod is a form of the word Voivode, that doesn’t likely make a connection with Ţepeş, given it was a title falling somewhere between warlord and prince and was born by numerous figures in Slavic countries. However, this is all part and parcel of mythmaking I suppose. The book consolidates fictions sold to tourists as they take tours of a city I understand to be possessed of a unique identity. As such it less chronicles and more aids the passing of those tales from fiction into myth and, so long as we understand that these are modern conceits and re-readings given a veneer from TV, movies and literature (at least when looking at them from an academic viewpoint) then they add a toothsome element to the mystique of New Orleans. On that basis, 7.5 out of 10. “surely [the vampires] would have been tortured”: The letter referred to, dated September 25, 2017, accompanied advance paperback copies of the book. –Ed. December 22, 2017: In the note below, I wrote “For the record, Marita’s middle name is Woywod.” It’s actually her maiden name. The error has been rectified. –Ed. For the record, Marita’s maiden name is Woywod. Her book is available in paperback and Kindle formats on Amazon. If you’d like an autographed copy, order it from her website. The first 100 copies, with leather wrap, have sold out. Disclosure: Marita is a friend of Vamped and has praised the site in her vlog, VBITE, as covered here and elsewhere on our site. However, Andy has no affiliation with her. The legendary story in the modern interpretation of the author presents us a completely different view of the famous characters. The change in their habitat has become fundamental in this.